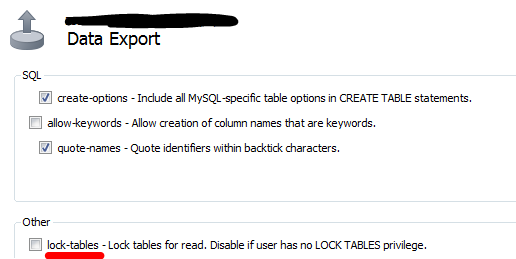 When I was trying to export a MySQL table in MySQL Workbench I got an error “1045: Access denied for user ‘****’ (using password: NO) when trying to connect. I noticed that user hadn’t “Lock Tables” privilege. In advanced options screen, you can disable lock tables for reading operations. Isn’t the most recommendable option, but is not a big perfomance penalty when you’re going to export small tables. If you have grant permissions privilege, you should grant “Lock tables” to the user. After disabling “lock-tables” option, you should be able to export tables.